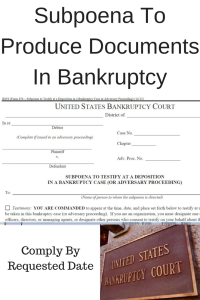 Subpoenas issued in consumer related bankruptcy cases are rare. They are usually issued by the United States Trustee pursuant to an investigation as to dischargeability. Although ordinary creditors do have the right to conduct 2004 examinations with court approval and subpoena documents, they often will not undergo the process because they normally don’t uncover any fruit. The United States Trustee does have the manpower, wherewithal and duty to investigate certain affairs of debtors in certain cases. The subpoena to produce documents is one strong method by which the US Trustee can start to examine the financial affairs of the debtor in an effort to determine whether or not an adversarial complaint objecting to either all or a portion of a discharge should be instituted. The subpoena is served upon the debtor, debtor’s counsel and it is filed electronically with the Clerk of the United States Bankruptcy Court. The subpoena basically commands the debtor to produce certain items at a date, time, and place specific. In the instant case, the place is the Office of the United States Trustee, 219 South Dearborn St., Room 873, Chicago, IL 60604. The trustee’s office has granted approximately 35 days leeway time to allow the debtor to produce the requested documents. The documents requested are part of a Rider to Subpoena which in this case is pretty lengthy. The subpoena in question is asking for documentation on all credit cards which had a balance in excess of $10,000. Those requested statements are for the period two years prior to the date of filing. The subpoena also requests the personal checking and savings account statements that the debtor had for two years prior to filing including any and all documentation therein. The Rider also requests the debtor’s divorce decree and any property settlement related thereto. The Rider requests all closing documents including mortgage statements, mortgage applications, closing statements, canceled checks and any other document related to real estate closings for two specific properties in Illinois. The Rider also seeks information on the debtor’s prior business. It is seeking canceled checks as well as contracts and invoices and any other information related to the debtor’s prior business. The Rider also wants to know what equipment may have been used or leased out by the debtor and the debtor’s prior company. Lastly, the trustee is seeking copies of the debtor’s tax returns for the past four years including any amendments and revisions. As you can see, the Rider is a comprehensive listing of items that the debtor must provide for examination. Once the trustee examines the documents that are produced pursuant to the subpoena, the trustee will have a certain date certain whereby to either file an adversarial complaint, bring a motion to extend the deadline to object to discharge or simply take no action. What is more likely to happen is the following: the trustee will examine the documents and realize that there are certain questions that he or she has which will require a complete examination. Thus, the debtor will be required to appear pursuant to section 2004 of the United States Bankruptcy Code to answer questions under oath with regard to the income, expenses, assets and liabilities and financial affairs of the debtor. This examination could last anywhere from 1 to 2 hours and it will be recorded. After such examination, the trustee will have a certain timeframe in which to either bring the action, seek additional time or to drop it. If the debtor provides all of the documentation required in the Rider to the subpoena to produce documents and if the US trustee is satisfied that there was no fraud involved, then there will likely not be an adversarial complaints filed. If on the other hand, if the US Trustee is convinced that there is fraud or other basis to object to the discharge either in part or in its entirety, and the US trustee will bring an adversarial complaint stating forth those allegations. 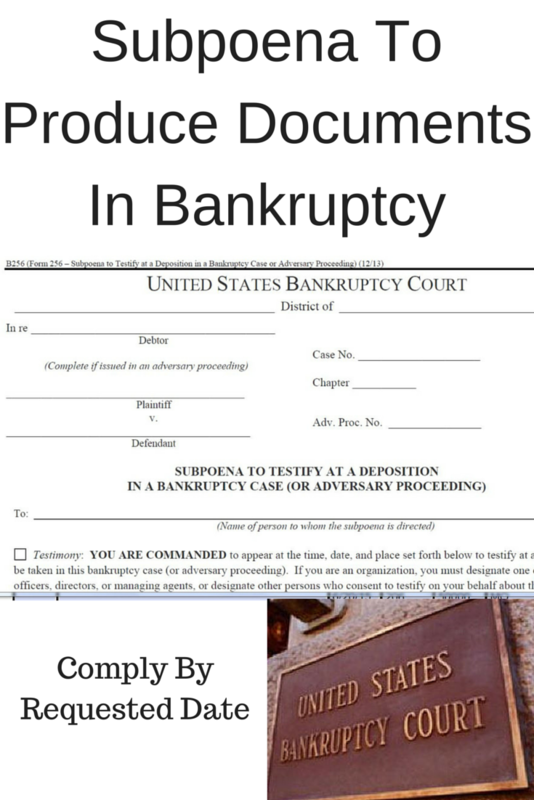 This complaint becomes a separate lawsuit within the underlying bankruptcy case. There would certainly be an additional fee for representation in this regard and the matter could last anywhere from six months to two years. In summary, if you as a debtor receive a subpoena to produce documents, you should consult with your bankruptcy attorney immediately. You do want to gather the information requested and make sure it is submitted on or before the due date. If you do not provide the documentation, the trustee will bring a rule to show cause in an effort to hold you in contempt for violating the subpoena. If you have not committed any type of fraud whatsoever, then you could feel confident that the documents that you provide will satisfy the trustee’s inquiry. If however, you have potentially committed a fraudulent act, then be prepared to defend yourself should an adversarial complaint be brought.